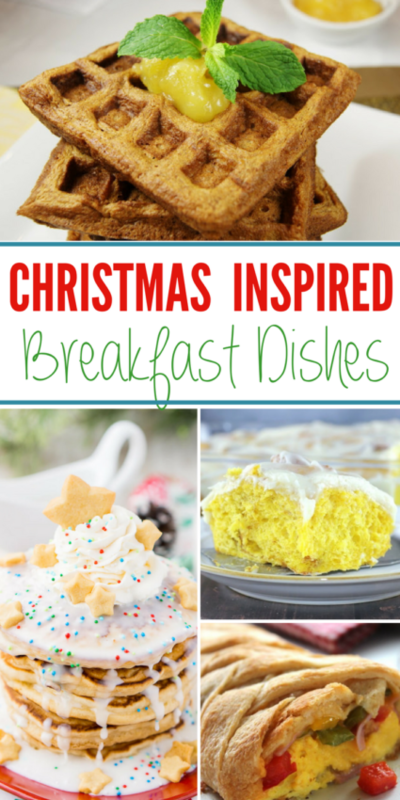 Christmas Breakfast Dishes To Serve Up on Christmas Morning! Gingerbread Waffles| Make holiday inspired waffles. A rich and spice filled gingerbread waffle will for sure get you in the holiday spirit this season. Baked Blueberry Pancakes| Sometimes pancakes take forever to make, but with this bake simply whip up the ingredients pour into a dish and bake to perfection. Easy Monkey Bread| A super simple monkey bread recipe you can whip up in no time flat. Biscuit and Gravy Casserole| Casseroles are my favorite way to cook, and this biscuit and gravy casserole is perfection. You get the delicious flavors in an easy casserole form. Candy Cane Cream Cheese Danish| Create this candy cane shaped cream cheese danish for your family. It is sweet and refreshing. Breakfast Casserole With Bacon| Fully loaded with eggs, cheese, and of course bacon! Arguably the most amazing meat on the planet. Sugar Cookie Pancakes| I seriously imagine these to be the best version of pancakes on the planet. These are a sweet and light and fluffy pancake that will put a smile on your family’s face. Cheesy Roasted Potato Bake| You have the hearty texture from the potatoes with rich cheese, fluffy eggs and more in this delicious bake. Ham Fritata| Looking for a savory fritata recipe? This one is a simple recipe and very scrumptious. Amish Friendship Bread| A dense bread that has a cinnamon and sugar crumble on top. I have made this many times and it is so yummy. Cinnamon Pumpkin Rolls with Cream Cheese| Looking for a pumpkin recipe, this is it. These are light and fluffy and irresistible. Which one of these Christmas breakfast dishes do you want to try first? I so need these! I’m totally out of breakfast ideas for my boys and I have guests coming in to town for the holidays. These recipes all look so amazing! We always have a special Christmas breakfast, and I think I’ll make a few of these for that. Yummo! From Amish to fritata to French all of these breakfasts sound so good that I will not be able to wait until Christmas holiday. I definitely love the look of those waffles on the post, great photo. I have been wanting to make gingerbread waffles for ages. Christmas morning might be a good day to experiment with it! Also the candy cane cream cheese danish sounds amazing! The Sugar Cookie Pancakes are calling my name! Heck, they all are. I wouldn’t mind waking up to any of these breakfasts on Christmas morning. These are great ideas. We always do a french toast casserole for Christmas morning breakfast. Prep the night before, toss in the oven as we are unwrapping gifts. What a great list. But sugar cookie pancakes? I need those in my life. I make a breakfast for Christmas morning. Anything I can prep the night before id ideal. These all sounc delicious. This is a great list! We usually do homemade waffles. The Breakfast Braid looks delicious. Maybe I’ll try that this year! My daughter has started doing the breakfast for dinner on Christmas eve. It is more laid back and everyone enjoys the meal. I know it’s awful, but I never make anything special Christmas morning. I always want to, but I never have time, and I’m usually up all night finishing up the gifts. Now I’m inspired though, and I’m really eyeing that Amish Friendship Bread. This is such a great list of Breakfast ideas. We usually do Pancakes but they take so long, I love the idea of popping something in the oven and having it bake while we open presents. I definitely want to try out the blueberry pancake bake and the breakfast braid. These are making me pretty hungry! I could definitely do with some delicious monkey bread on Christmas. I always love Christmas mornings. After sharing in the excitement of the kids opening their gifts, we like to eat breakfast. Our family would love the hash-brown casserole! Sugar cookie pancakes sound awesome. Actually, all of these sound really good! It would be so nice to prepare Christmas dishes for the family throughout the season especially on Christmas morning! I think these are wonderful ideas! They’re all worth taking note of. What a great list of Christmas dishes. The cowboy breakfast and the easy monkey bread jumped out at me. Great ideas! We will definitely be trying the gingerbread waffles. Yum! Christmas breakfast is a tradition we’ve had for a few years. These are all amazing breakfast ideas! There’s so many things to love in this wish. I’d go with gingerbread waffles or baked blueberry pancakes. These all sounds super yummy! We usually do french toast for Christmas morning! I would totally pick the Cowboy Christmas Casserole for sure. You had me at sausage really. We usually do an egg dish of some sort for Christmas morning. I love the slow pace we get to enjoy all together. Oh man, I’m so hungry for breakfast now! So many of them sound good, it’s hard to decide which I’d like to have first! These are awesome breakfast ideas! And they all sound SO delicious! Will add some of these to our holiday breakfast menu! Wow, these are some really unique ideas! I want to try them all! I am eye balling that Christmas casserole. That thing is a beast! That ham fritata has my name all over it. It looks very good! Cowboy Christmas caserole sounds great! And the hash brown as well.. ooh all those yummy food! My husband made me pumpkin pancakes on Thanksgiving. Wow, were they good. I especially like the idea of making a gingerbread treat. That isn’t something I experience very often. Great list! Preparing Christmas breakfast/brunch has now become a tradition in our family…so your shared recipes will definitely come in handy! Thanks for sharing! I do the same thing! Who wants to be cooking on Christmas morning??? Maybe I’ll have to try a new casserole this year. All of these look great! So many of these would make a great weekend breakfast even with no holiday! Can’t wait to try a few of these. AHHHH! These would be great for Christmas breakfast. I am going to have to do a countdown to christmas breakfast daily now to try these all! Thanks for this list. I am actually going to be home on Christmas and Christmas Eve and can make multiple breakfast things. I love sausage egg and cheese casseroles. Thanks for the reminder to put it on my list to make sure I have the ingredients! The baked blueberry pancakes have been added to my list and I will prepare them for boxing day! I am like you, I also plan ahead and as you can see, I am on Boxing day already lol. Thank you for contributing to my holiday recipes Robin! I love Cowboy breakfast casserole! That is something we always do for Christmas Eve breakfast. We always have crepes on Christmas Day! I typically make cinnamon rolls for Christmas breakfast, but this year I want to branch out and try something new. Thanks so much for the breakfast inspiration! Breakfast Holiday brunches are fun. These are some great items to make on Christmas morning. The gingerbread waffles sounds really good. They would be perfect to try out my waffle maker. I really want to try a breakfast casserole. It’s something I haven’t made before so I would try all of those first. After that, it would be the Candy Cane Danish. BB is going over to YOUR casa for breakfast- they all sound DELICIOSO!! ALL of them. What time should Sweetie and Babushka be there? Ohh so many yummy ideas! I think I usually end up doing French Toast, but this year I want to shake things up. Oh wow, thanks for these bunch of recipes! Surely my sister will be very delighted to read all of it. Christmas will be so merry!!! Yumm! So many mouthwatering recipes to choose from! I think I’ll add the Candy Cane Danish and Sugar Cookie Pancakes on our menu asap! Christmas Breakfast is our JAM! We actually prefer Christmas breakfast over Christmas dinner, so now we do Christmas Brunch and then just snack for dinner. LOVE LOVE LOVE these recipe suggestions! I am counting the days until Christmas to do up a special breakfast! I cannot wait. These all look so good, will have to choose one! All of these look amazing! How awesome would it be to line up the entire month with holiday themed breakfasts?! Breakfast is my favorite meal. I like to add an element of the holiday that’s going on in the meals.